There are many species of the Scorpion, but there are four more commonly known Scorpions: the Common Yellow, the Red Scorpion, Black Scorpion and the Giant Scorpion. This Scorpion is seen the most living througout the dry regions of both the Ráhaz-Dáth Desert and the Continent of Aeruillin as well as many warmer parts of Santharia. The Common Scorpion is probably what people picture when they think of Scorpions. It has a dark yellow/brown on its body and a paler yellow on its legs and tail, it is also quite transparent. The Common Yellow is a medium sized Scorpion, between 2 to 10 nailsbreadths. This Scorpion is quite poisonous, but its sting will not usually result in death for humans. The Red Scorpion is also quite common in fact, but is generally not often seen. It is mainly found in the Lands of Pain within the Ráhaz-Dáth Desert, but is also scattered throughout Aeruillin mostly in the Nytheranian Dunes. Its body is an orangey red and its legs are a transparent red. The Red Scorpion is one of the smaller species of Scorpion, between 0.5 and 3 nailsbreadths long. It is highly advised to stay clear of the Red Scorpion, as it has a very high potency of poison and can kill a human if stung. The Black Scorpion is only found near the Norong'Sorno Volcano and in the region around Thalambath in the Ráhaz-Dáth Desert, this is possibly because of the black volcanic stones that cover the area. This Scorpion is all black, with no transparent parts. It is slightly larger than the Common Scorpion, ranging between 3 and 15 nailsbreadths. 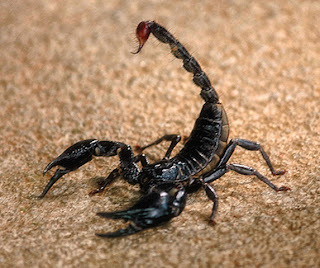 The Black Scorpion has the potential to kill a human in its earlier years, but will slowly lose its potency as it ages. The Giant Scorpion lives mainly in the deserts of Aeruillin, found mostly throughout the Sveltash Desert and the Desert of Ysthalinth but also scattered through many other areas. They are not, however found anywhere near or in the Desert of Light, nor are any other Scorpion species, this is thought to be due to the Giant Bloodworms inhabiting this desert. The Giant Scorpion is thought to be a larger form of the Common Yellow Scorpion, because it also shares the same colorings. This Scorpion, however, is not poisonous to humans. Its size ranges from 1 to 2 fores long, giving it quite a frightening appearance. Because its sting is only minorly poisonous, it also doesn't hurt as much as a poisonous Scorpion's sting. The Giant Scorpion's sting feels more like being stabbed with a stick, still some pain but not enough to really hurt you. Scorpions are nocturnal creatures, preferring to hunt in the dark of night. During the day Scorpions sleep in burrows under the ground or under the desert rocks. It is rare that you will see a Scorpion out in the light of day, unless it has been roused from its burrow, awakened by the noise of larger predators. 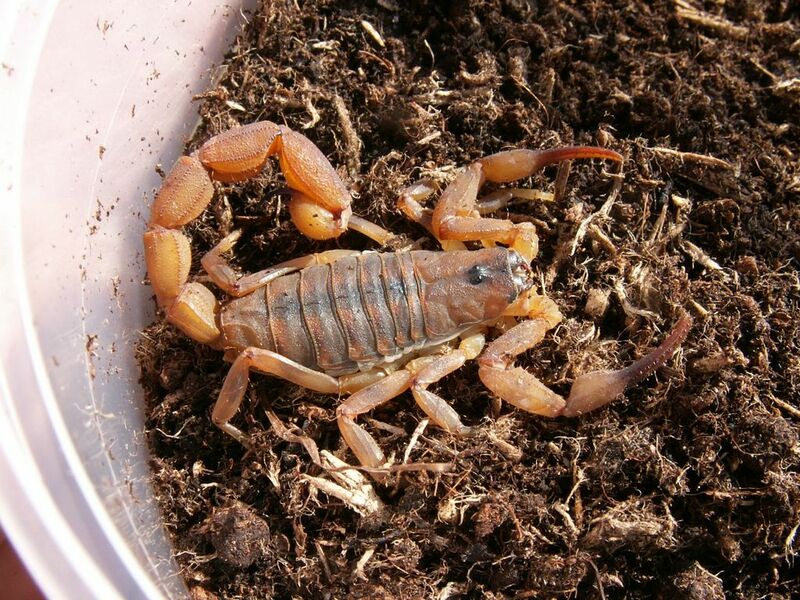 It is not recommended that you go looking for Scorpions as they will sting if threatened or provoked in any way. Scorpions hunt for their food, using their long stinging tails to kill or immobilize their prey. The Scorpion feeds on various invertebrates, particularly insects, during the mild hours of the warm night. Depending upon the size of the Scorpion, they can eat lizards of medium and small sizes, small snakes, rodents and even other Scorpions. Scorpions have their own special mating ritual in which the male will use his pinchers to grab the female's pinchers and pull her along in what can only be classified as a "courtship dance". In some species the male will even sting the female, however, this does not cause her any harm. During this "dance" the male will drag the female along the ground until he has found a good spot to lay his seeds (usually on a twig or rock). After the male has lain his seeds, he will then drag the female through them and she will secrete them into her body through an opening in her abdomen. The Scorpion's tail is its deadliest and most powerful weapon. It can kill smaller prey in seconds and prey such as lizards, birds and rodents in minutes. The smaller a Scorpion is, the more potent its venom will be. As Scorpions grow, their venom gets more diluted by the water they pick up throughout the years. Also, the smaller the Scorpion, the more painful the sting it produces, because of its poison potency. A man once compared the sting of a Scorpion with the punch of a full grown man giving it all he had. It is very important that a Scorpion sting be treated within an hour of occurrence. If stung and untreated, a human will last up to 12 hours before death sets in. In these 12 hours, the victim will suffer immense pain from the area of the sting which will then travel throughout the body. In the last hours, fever sets in and violent muscle spasms begin, then in a fit of seizures the human will die (times may vary considerably at other races).